We first arrived in Sydney on August 6, 1968. My father had already arrived a few months prior. He was posted in Sydney as a company representative for a Japanese trading company. He picked us up at the airport and deposited us at the Savoy Hotel in Double Bay, leaving my mum, that’s Kei, with a $20 bill to buy something for dinner. Kei remembers thinking how the $20 looked suspiciously like play money, but my father reassured her that it was worth about 8000 yen. An aside: the AUD-Yen exchange rate was about 400 yen to the dollar in 1968. Today, it’s about 80 yen to the Australian dollar. Armed with ‘play money,’ Kei took us (I was 7, my sister 9), to Double Bay Woolworths, which was across the road from The Cosmopolitan then, where she bought half a pound of rice for 9 cents. I don’t know how many times I’ve heard this story, but still, after 50 years, I love to revel in her shock of discovering that a roll of toilet paper cost 11 cents, while half a pound of rice was 9 cents. (Paper was/is incredibly cheap in Japan, in fact loo paper was free in those days – rolls would miraculously appear at the front door a few days after leaving a bunch of old newspapers – and rice has always been expensive in Japan, thanks to Japan’s agricultural co-operative). On the way home, my sister and I begged mum to let us stop by for a some tea at the Cosmopolitan. But Kei had no idea how much tea would cost (after all, toilet paper cost 11 cents!) so we went back to the Savoy where she cooked up some rice and grilled the dried fish a friend had given her at the airport prior to our departure (I guess he must’ve thought there’d be no himono or dried fish in Australia, so true). The fish was great I remember, and so was the ‘foreign’ rice. We were lucky that we didn’t get evicted from the Savoy for the stench Kei inflicted on the other residents grilling the fish. Perhaps we were copped a few rude stares the following morning. Luckily, I was too young to notice. Already in the first few hours after arriving in Sydney, the pattern of our lives in Australia for the next 50 years was set. 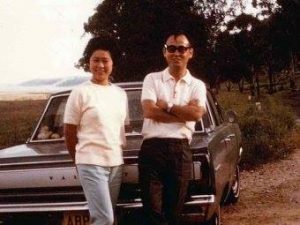 Kei would be in constant search for good food to feed us; we’d always be hankering for something we thought might be more exotic, only to find that mum knew best; our food would stigmatise us; and finally, my dad was always conspicuous by his absence. Today, August 6, 2018, it was too cold to go out to celebrate our 50th anniversary. So we decided that when the weather is warmer, we’ll go to the Cosmopolitan for a cup of tea. Here’s hoping $20 will be enough…maybe not.